Arnaudville, LA – Arnaudville’s Bayou Teche Brewing is releasing their latest in a line of their very limited edition and innovative beers. The beer, named 5 year Anniversary Sour is brewed in celebration of the anniversary of the brewery’s fifth year in business. The beer is a German-style Berliner Weisse – a sour, tart, fruity, highly effervescent, spritzy, cloudy and refreshing ale traditionally brewed in Berlin. The ale is first soured with lactobacillus, and then persimmon puree is added. Fresh yeast is then pitched for the ale’s fermentation. The resulting beer is then aged cold and then dry-hopped with Equinox hops to add a final herbal and funky complexity to the beer. Berliner Weisse is a top-fermented, wheat beer made with both traditional warm-fermenting yeasts and lactobacillus cultures. They have a rapidly vanishing head and a clear, pale golden straw-colored appearance. The taste is refreshing, tart, sour and acidic, with a lemony-citric fruit sharpness and almost no hop bitterness. Brewmaster Gar Hatcher says that Berliner Weisse is “an unusual beer style brewed historically in Berlin. It’s on old beer whose lineage dates back at least to the Middle Ages. When Napoleon occupied Berlin in 1809, he dubbed Berliner Weisse the “Champagne of the north.” To craft this ale Gar used French Pilsner malt to give this ale a bit fuller body than North American pilsner malt. The Bayou Teche brewers feel that the French malts have a touch more roundness to them. Unlike most beers, there is no residual sweetness in a Berliner Weisse whatsoever, which makes it an ideal warm-weather drink. A tart Berliner Weisse can be very refreshing, especially on a hot afternoon, when you might be sitting outdoors. It has a dry and a subtle fruity aroma, with a whip crack of acidity. It is very dry, almost champagne-like and thus the finish is crisp, elegant, with just a very slight note of lemon and persimmon. The nose is funky and barnyard, and Dorsey says that everyone at the brewery is extremely proud of how the 5 Year Anniversary Persimmon Sour turned out. The brewery recommends serving the ale as an aperitif, or pairing with Eggs Benedict, a simply dressed salad, French fries topped with bacon, fried catfish, roasted pork or duck, and any buttery cheese, like Brie, Gouda and some of the earthier blues. Bayou Teche Brewing has been widely recognized for their unique Cajun ales in the five years they have been in business. The brewery has won five silver medals at the World Beer Championships and has been featured on the Food Network, and named best craft brewery in Louisiana by the Esquire Television Network. Their LA-31 Biere Pale was named best beer brewed in Louisiana by Southern Living, and featured in Garden and Gun, Draft, Beer Advocate, All About Beer, Business Insider, Food and Wine, Imbibe and Martha Stewart Living. They have also represented Louisiana at the Great American Beer Festival and invited three times to be presenters at Savor in Washington DC – the nation’s most prestigious beer and food pairing event. 5 Year Anniversary Persimmon Sour is packaged in 22 ounce Belgian-style bottles and will be initially available in the brewery’s Arnaudville tap-room. 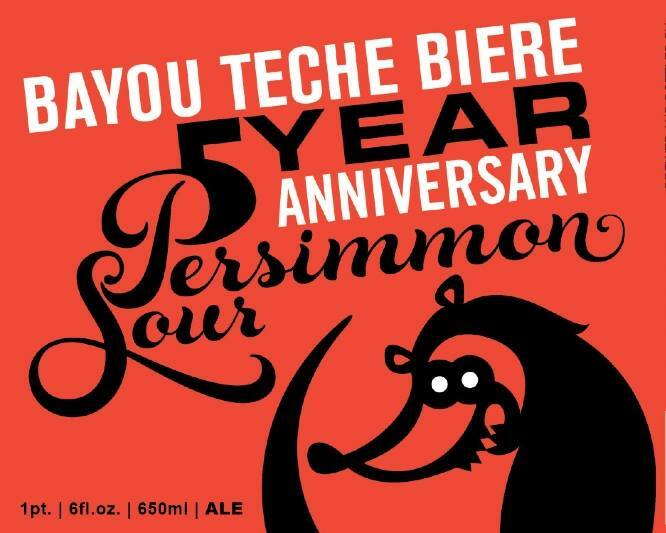 The 5 Year Anniversary Persimmon Sour Release/Birthday Party is Saturday, January 31st from noon until 7pm. There will be a Cajun Jam session from 11 until 1, and then live music will be provided by the Zydeco band Soul Creole. Taco Sisters Food Truck will be on sight providing their tasty Cajun influenced tacos and burritos, and other dishes from their menu to complement Bayou Teche Brewing’s new sour ale. The following weekend, the Avenue Pub hosts the New Orleans anniversary party and Persimmon Sour Ale debut. Beginning at 12:05 p.m., the pub will tap the birthday beer as well as other Bayou Teche barrel-aged favorites, along with the brewery’s seasonal Carnival beer, Courir de Mardi Gras. Fittingly, three Mardi Gras krewes will be also be parading in front of the brewery’s New Orleans’ anniversary party – a fitting and appropriate way for Bayou Teche’s brewers to celebrate 5 years as a Louisiana business.